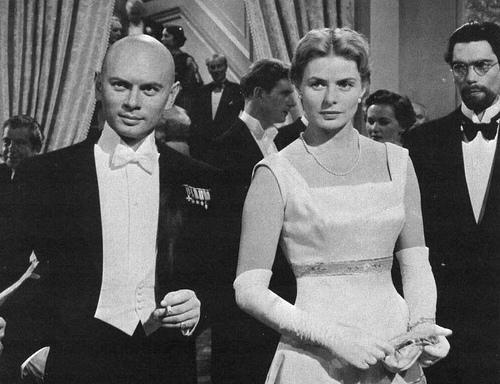 Yul Brynner and Ingrid Bergman - ऐनस्टेशिया. Selected moments from the 1956 Ingrid Bergman and Yul Brynner classic.. Wallpaper and background images in the Yul Brynner club tagged: classic actors yul brynner classic hollywood photo anastasia ingrid bergman. This Yul Brynner photo contains बिजनेस सूट. There might also be ड्रेस सूट, पूरी पोशाक, tailcoat, पूंछ कोट, पूंछ, सफेद टाई, सफेद टाई और पूंछ, पोशाक सूट, पूर्ण पोशाक, टेलकोट, पूँछ कोट, पट, सूट, and कपड़े का सूट. Yul Brynner in dressing room in the movie "The Ten Commandments"